Shorty is a remarkably talented and completely self-taught musician. During World War Two he hosted his own radio show. One of his guests was Frank Sinatra. 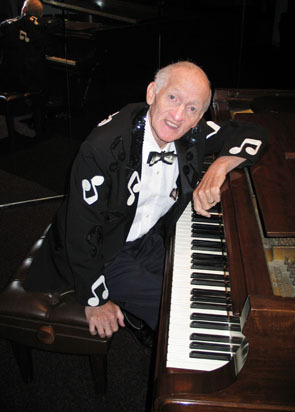 Shorty is billed as the fastest piano in the East, a well deserved title as his numerous awards from ragtime competitions throughout the country attest. Elvis Sinatra has it’s roots with Shorty in the days when he and George performed together at Bumblebee’s on the Boulevard, a Providence night spot owned by handsome guy Ted.